Why do I ask? It just so happens to be the day after the 55th birthday of one Barack Hussein Obama. I can just blurt out that this has everything to do with worship of the Ancient Egyptians as August 5 is the most recognized date of the helical rising of the dog star Sirius which served as a sign of the beginning of the annual Nile Flood and the Egyptian New Year which in turn is VERY significant to our Illuminati overlords. But before I blurt it out some basic background is in order. Ancient Greek philosopher Plato is probably the singular most popular and referenced intellectual by many of the statist/communist university types in Europe over the past several hundred years and more recently here in the US. These same university types are the ones that start at places like Yale's Skull and Bones and that cesspool of human educational degradation known as Harvard excuse me Haaarverd. The mostly liberal brainwashed students eventually fan out into 'advisory' roles with 'our' District of Criminal politicians, the media, banking, etc. The upshot is our controllers are very much steeped in Plato's statist communist humanistic Godless philosophy which sounds great in an Ivy League classroom but results in tyrants like Mao and Stalin (and soon O-bama-Nation). Google and watch Plato's "Allegory of the Cave" which basically likens us out here in the unwashed masses as dumb, stupefied slaves and losers chained as prisoners in a cave ready to accept our lot in life doled out by our overlords. The entrance of Plato's Academy (think Ancient Greece's own Harvard and Yale) had a quote that read "Let no man ignorant of geometry enter here". The invisible god of the Freemasons (the one whose eye stares out at us from atop the aforementioned Great Pyramids of Giza) is known as GAOTU or Great Architect of the Universe. This god is one in same with Osiris, the onetime Egyptian god of the sun who became dead and rules the underworld and whose open Illuminated (think Illuminati) eye resides above the aforementioned Egyptian Pyramid on the back of "your" Federal Reserve Notes. He is equivalent to the Greek gods Apollo and Hades. (Interestingly enough Hades is both a place of the dead and a god much like Osiris). And yes we need to be worried because Apollo is one and same as a certain Apollyon mentioned in Revelation 9 that combines Apollo and 'On', another name associated with Osiris. For our purposes the take away from all these facts is that our criminal psychopathic overlords are very much into symbolism, numerology and Sacred Geometry. Enough with the boring background stuff; let's get to it. Let's start with the multi-named scam Barack Hussein Obama Soebarkah Barry Soetoro. In a recent article it was pointed out that this guy is the ultimate man of mystery. He has multiple names, no birth certificate, and multiple documented places of birth and has spent millions of dollars fighting any and all Freedom of Information Act attempts to review his academic records and the background of his life in general. He was a political unknown who was thrust upon an unsuspecting American imbecile majority as the Messiah back in 2007-2008. The point here isn't to rehash Obama's mysterious background but that some very powerful people (i.e., the Skull and Bones crowd) wanted this scam in the White House at this point in our history. Now let's look at the numerology of Obama. In general, I'll keep the discussion in numerical order. 18: This represents the Rose Cross or Rosicrucian degree of the Scottish Rite Freemasons. Many Freemasons openly admit it's no coincidence that this degree breaks down to 6+6+6 or the number of the beast of Revelation. The Rose represents the divine male and Cross the divine female. The Rosicrucians or the Brotherhood of the Rosy Cross was a group Enlightenment European intellectuals who served as a link between the Knights Templar and later groups including the Bavarian Illuminati and modern day Freemasonry which in turn led to groups including the British Round Table, the Council on Foreign Relations and Skull and Bones. And this number just so happens to be the founding date of the Georgia Guidestones, March 22, 1980. (The Spring Equinox is generally regarded as March 22 and is associated with the female Mother Goddess known as Isis; more on her below). For our purposes here the Georgia Guidestones have etched in stone what I have dubbed "The Anti-10 Commandments" which basically call for the elimination of 90% of the world's population and the establishment of a world government for the 10% that's left. The man who facilitated the construction and provided the funds was a mysterious character that went by the name Robert Christian whose initials RC is actually symbolic of the Rosicrucians associated with the 6+6+6 degree of Freemasonry mentioned above. Obama-nation Care was completed on March 22, 2010 and signed into law on March 23, 2010 or exactly 30 years to the date of the founding of the Georgia Guidestones. According to Luke 3:23 Jesus began His ministry at 30 years of age. This is very significant for one that is the media and self-proclaimed Messiah. 44 represents the unification of male and female based on the numerology of Ancient Hebrew. The Greed god Hermes or the "sun" of god represents the unification of male and female or the Rose and the Cross, respectively (see brief discussion on the Rosicrucians above). Interestingly enough Mr. Booth also equates the hero of Freemasonry Hiram Abiff with the aforementioned Robert Christian (or "Saint Germaine" who was discussed at length in Section 3 of "THEorY of LIVEvolution" available for a small donation on my web site). And of course we have the unknown man of mystery the enigmatic Obama-Nation coming out of nowhere to be the 44th president of these United States. And Hiram Abiff equates to the Egyptian sun god Osiris who in turn equates to copious other sun gods throughout the world past and present including the Babylonian Marduk, Canaanite Baal, the Egyptian On and Ra, the Greek Apollo (think Apollyon from Revelation Chapter 9) and Zeus and the Roman Jupiter amongst many others. These all equate to the 'Divine Father' in all these cultures. And of course several of these sun gods relate to a certain golden calf of Exodus if you believe that sort of thing. Perhaps most importantly 44 is the sacred number of the falcon/eagle headed god Horus. In "Ancient" Egyptian mythology Horus is generally recognized as the sun or son of the two main deities Isis or female and Osiris or male. An equivalent offspring of this male/female combination is the Egyptian god Thoth/Greek god Hermes from where we get the term 'hermaphrodite' or combination of male and female. Every Egyptian Pharaoh was regarded as the 'sun' or 'son' of the Isis and Osiris. And because of this divine lineage each Pharaoh was granted a third or open eye that illuminated his view of the world and reality in general (think Illuminati). 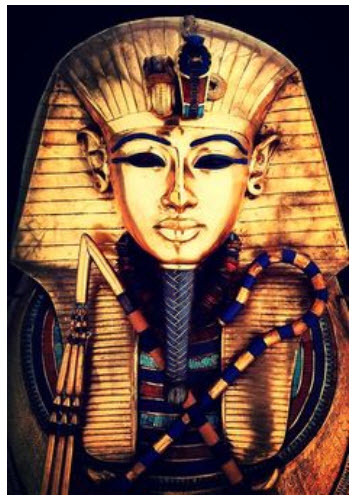 Here is an example of that third eye on this King Tut like rendition. The third eye (which some people associate with the pineal gland of the human brain) is represented by that serpent emanating from Pharaoh's forehead. And where did we read about a serpent opening the eyes of humans? Right…this goes back to Genesis 3. Lucifer the angel of light told Eve she could 'see' or gain Illumination by eating from the Tree of Knowledge of Good and Evil. God didn't see things, no pun intended, that way and booted them out of the Garden of Eden. Here we have the male column on the left represented by the sun or the sun god Osiris/Apollyon and the female column represented by the lunar goddess/Isis on the right. And the black and white checkerboard of Freemasonry represents the male/female interaction and is associated with the Eastern religion ying/yang principal so you can see the concept of Freemasonry (but not necessarily the way it's practiced in the West) is worldwide. And keep an eye, no pun intended, on that casket like structure at the base of the stairs. This represents the 'dead' human that must come out of the casket and be 'born again' before he/she (there are female groups of Freemasons) climbs the stairs that represent the three original Degrees of Masonic Initiation. (Now there are 33 Degrees in the Scottish Rite and 8 Degrees in the York Rite of Freemasonry but this is outside the discussion right now). And what does he find when he/she gets there? An open Bible (the Freemasons are closet Satanists that regard the Bible as good sourcebook of material to learn about their god, Lucifer). Above the Bible is a five pointed blazing star with a "G" in the middle of it. In Freemasonry the 5 pointed blazing star is emblematic of the pentagram of Satanism. The minor difference is that the Freemasons form their star with "Geometry" (or 5 triangles at 72 degrees which is the basic structure of the pentagram) in honor of the "Great Architect Of The Universe". Besides Geometry the G can stand for "God" or "Gnosticism" (i.e., the ability of man to become god in true Garden of Eden fashion). More importantly we have the aforementioned all seeing eye of Horus with the word "Lucifer" underneath it. This represents a supposed difference between Freemasons and Satanists. That is Freemasons worship the Great Architect or Lucifer the Angel of Light or Illumination and the Satanists worship the dark lord Satan. My friends, they're the same entity. Nonetheless here's 'the Messiah' or 'sun of god' speaking down to us between Jachin and Boaz, the sun and the moon, or the Pharaoh speaking to his subjects. 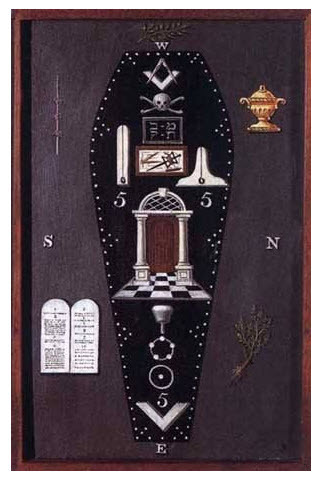 55: Recall the casket at the base of the Freemason symbolism mentioned above. Now look at the more detailed one below. There so much to go over but let's highlight the relevance here. Notice the 10 Commandments in the lower left which indicates the Freemasons do in fact venerate the Bible in their own twisted way as discussed earlier. 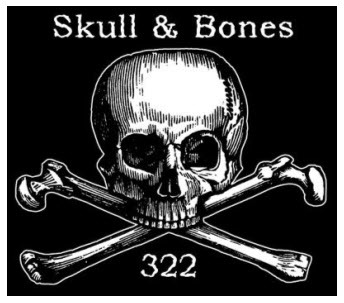 We have the Skull and Bones in an obvious connection to "322" and the American Illuminati, Yale University's very own Skull and Bones mentioned above. 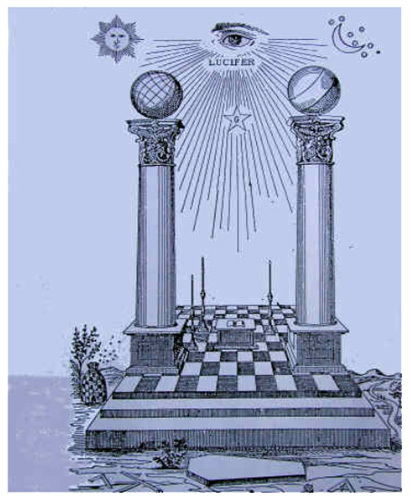 And of course we have the male/female principle shown in multiple ways including the columns Jachin and Boaz and the black and white checkerboard. This is also shown in the circle with the dot in the middle. In Ancient Egyptian 'mythology' and Freemasonic lore this is representative of the male (Osiris) phallus being inserted into the female in order to give birth to Horus, the sun or son of their god. But most importantly notice the triple 5s in veneration to the blazing star or G star of Freemasonry which as previously mentioned is directly related to the Satanic Pentagram. In Ancient Egypt the helical rising of Sirius or the re-appearance of Sirius was a very big deal. It was their New Year and marked the annual flooding of the Nile which provided the water and fertile material needed for the growing season. Sirius is known as the dog star (in the Bible dogs are often associated with demons see Matthew 15 and Revelation 22). Its rising date varies throughout the year from mid-July to early August but the most popular date associated with it is August 5 or 1 day after the 55th birthday of our no birthdate Obama whose supposed birthday is August 4, 1961. So what have with Obama are triple 5s, 55 years old on the first day of rising of the dog star. Sirius is symbolic of the 'Great Architect' or male god Osiris/Apollo. 72: There are 72 degrees in each of the base angles that make up the five outer isosceles triangles of the five pointed Satanic Star or Pentagram that shows up between the male and female columns as mentioned above. This multiplies to 5 x 72 or 360 or 6 x 6. Well known mason Albert Pike ties the number 72 into the Hebrew alphabet where it represents the unmentionable name of their hidden god (who as I continue to point out is represented by Apollo/Osiris of Greek/Egyptian mythology). This will be further discussed in the sequel to this article. 216: Earlier it was mentioned that this guy's birth place AND birth certificate are complete mysteries. So he has no 'official' birth date. But he claims August 4, 2016 as his birthday. Well this just so happens to be the 216th day of the year. And it just so happens that 6x6x6 = 216. This is VERY significant in this context. Where else do we see three 6s? Why of course Revelation 13 where it tells us to calculate or count the number of the beast. Now we have 6x6x6 here AND 6+6+6=18 just so happens to represent the 18th or Rose Cross (i.e., Rosicrucian degree) of Freemasonry. Circle back to "Robert Christian" and the Georgia Guidestones discussion above. 2016: In numerology and occultism, 0 is generally regarded as a meaningless place holder. So now we have redundancy with the number 216 mentioned above. 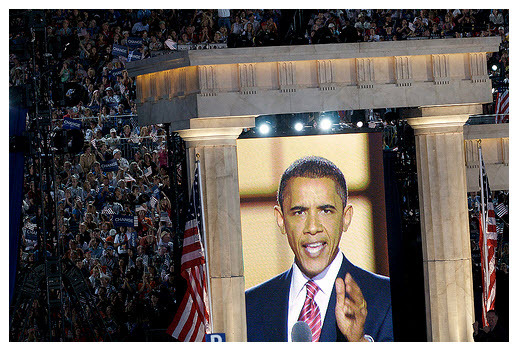 Now try this one on for size: on August 5 of this year 2016 it will be the first day of the 55th year of Obama. Again, this is the 216th (6x6x6) day of the 216th (6x6x6) year and Obama will be 55 which when combined with the August 5 day of the dog star yields the three 5s pasted on the Freemasonic coffin above. 6606: With no 0 we have "666". Judges 4:6 is the first place where the name "Barak" appears in the Bible and it just so happens to be the 6606 verse of the entire Bible. In isolation any one of these 'coincidences' could be laughed as conspiracy quackery. But look at the aggregate and remind yourself who we in the White House: a complete enigma who has no real name but whose most popular name comes out of the 6606 verse of the King James Bible born on the 6x6x6 day of the year who "The Establishment" paraded in front of "the imbecile majority" as "our" next leader who just so happens to be the 44th (Horus/sun of god) President who brought us the Rosicrucian based health care debacle in Messianic fashion 30 years to the day of the founding day of the Georgia Guidestones that in turn were founded on Skull and Bones 3/22 or March 22, 1980 and whose pentagram associated 55th birthday will happen on the 6^3 or 6x6x6 day of the 6x6x6 year AD. And we haven't even gotten to the fun stuff yet, the numerical connections of Barack Hussein Obama's fake name itself. This will be the subject of Part 2.